​Rabbi Avraham Yitzchak HaCohen Kook was the first Chief Rabbi of British Mandatory Palestine. When World War I erupted he found himself stuck in London where he remained for the duration of the war until he could return to the land of Israel. Rabbi Kook spoke about how during his time in London he would often visit the National Gallery to admire the art there. His favourite artist was Rembrandt, who he described as a tzadik, a righteous person. When he examined Rembrandt’s paintings it reminded him of the rabbinic statement about the light created on the first day of creation – “When God created the light [on the first day], it was so strong and luminous that it was possible to see from one end of the world to the other. And God feared that the wicked would make use of it [for destructive purposes]. What did He do? He hid it for the righteous in world to come. But from time to time there are great men whom God blesses with a vision of that hidden light.” Rabbi Kook believed that Rembrandt was one of those great men who could perceive the Or Ganuz (hidden light), and he presented that light in his paintings. What is equally puzzling and wonderful about Rembrandt’s paintings, is that he makes no attempt to beautify or idealise his subjects. Yet the light radiating from the ordinary people in his paintings. Rembrandt’s brilliance is his ability to convey the beauty of ordinary people. The light that shines from them is, simply, their humanity. Their Tzelem Elokim (image of God). QUESTIONS TO PONDER: 1. What do you think Rembrandt was trying to say in his paintings when he chose to have ordinary people radiating with a spiritual light? 2. If all people are created in the image of God, do you think we can say there is beauty in all people? How do we find that beauty? ArtistMany pieces of fine art involve an interplay of light and shadow key elements in the composition of almost every artistic work. At first glance, a shadow appears to be something that conceals light. However, according to the teachings of Torah, everything G‑d created was for His glory. This must apply to the shadow equally as to the light. Indeed, properly executed and skillfully placed, a shadow can also provide an important effect. Though the shadow’s “illumination” is of a different nature than the revelation and effect of the light, its appropriate application can actually enhance and highlight the effects of the light. From this, we can derive an important lesson whenever we encounter dark times and in our times when spirituality is less visible, these dark times may seem more numerous than the good. We should use the negative in a positive way, so that every spiritual “shadow” should come to be recognized as a “setting” that highlights the glory of the Creator. printed in Likkutei Sichos, Vol. 23, p. 341ff. 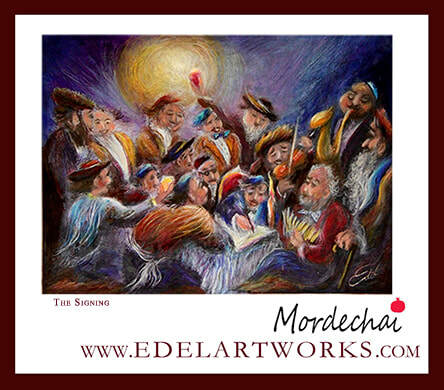 Edel epic portraits are custom painted ,often humoourous epic scenarios reminiscent of Normon Rockwell settings . Imagine these paintings as scenarios from a film or theartre set. Each tell a story , vignettes and joyful celebrations of life. Portraits may incorporate your friends or family and differ from photographic reality in that they depend on Mordechai's artistic licence imagination to develop the story and ambience and Portraits of characters involved are not intended to be photographic likeness but rather are "typecast" to permit artistic licence and freedom of expression of the "stars " involved in the Edel show .